“This weekend marks the beginning of Rosh Hashanah and the Jewish New Year, signifying the time for a new beginning.“Rosh Hashanah is one of the most sacred days of the Jewish calendar. It is the first of the High Holy Days, a 10-day period of repentance in which the Jewish people around the world reflect on their faith, re-examine the past year and look to the year ahead. “The Jewish community has greatly enriched our country, and this holy day presents an opportunity to acknowledge their invaluable contributions to all aspects of Canada’s society. “To all those celebrating Rosh Hashanah, Laureen and I extend our warmest wishes for a healthy, peaceful and prosperous New Year. Int’l Jewry continues to press Israel’s leaders to act on behalf of Johnathan Pollard. President Shimon Peres received a letter from a delegation of rabbis and professors in Montreal, Canada imploring him to seek the release of convicted Israeli spy Jonathan Pollard. We warmly welcome you to our community in Montreal. As a distinguished representative of the State of Israel and the Jewish people worldwide, it is our pleasure to host you. We all share your pride at being awarded the US Presidential Medal of Freedom. As representatives of the Jewish community of Canada, we support your humanitarian appeal to President Obama for clemency for Jonathan Pollard. The Jewish community of Montreal stands behind your efforts on behalf of the release of Jonathan Pollard. We would like to encourage you and to ask that you act according to the best of your abilities so that your appeal will be answered in the affirmative. Mr. President, we all recognize that your efforts can bring about Jonathan’s release and save his life. Please act in order to bring this terrible tragedy to an end. 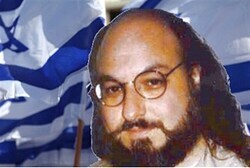 Pollard, a Jewish-American convicted by the United States on one count of supplying classified data to a foreign nation, has been serving a sentence of life without parole since 4 March 1987. In recent years, as Pollard’s health has deteriorated, his release has become a growing concern of the American Jewish community – and Israel’s nationalist camp. The disproportionate length of Pollard’s sentence when compared to other’s convicted of the same crime – almost always less that 7 years – has also become a point of contention with American Jews. Both Prime Minister Binyamin Netanyahu and President Shimon Peres personally asked US President Barack Obama to grant Pollard clemency on humanitarian grounds during their respective meetings in the White House earlier this year. 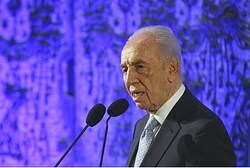 Peres made a second, direct personal appeal to Obama for Pollard’s release following the latter’s sudden hospitalization on April 4. Israel’s president is expected to ask Obama to grant Pollard clemency a third time when he recieves the Medal of Freedom in Washington DC in June. Peres will carry with him a letter bearing the signatures of 80 Israeli lawmakers. President Shimon Peres praised Canada’s long friendship with Israel as he conducts a series of working meetings with leaders there. 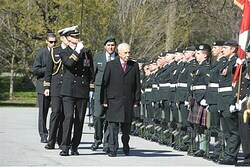 Canadian Governor-General David Johnston welcomed President Shimon Peres to Canada on Monday. The two men followed protocol by reviewing the ceremonial honor guard that greeted Peres with a 21 gun salute and issuing joint statements, before holding a working meeting. “Ever since, I have carried in my heart the feeling that Canada is land which is friendly, supporting, and caring towards Israel. I have never felt Canada is indifferent,” he explained. As Governor-General in Canada, Johnston fills a role as Ottawa’s federal vice regal representative of Canada’s monarch, Queen Elizabeth II. His role is similar to that performed by Peres in Israel, but he also executes the constitutional duties of monarch in Canada, which remains a part of the British Commonwealth. Johnston was appointed by Prime Minister Stephen Harper with Queen Elizabeth II’s consent. Later, Peres is expected to hold a private working meeting with Canadian Prime Minister Stephen Harper. Afterward, he will attend an official lunch in honor of his visit with government ministers at the Canadian Parliament. He is expected to discuss political issues including recent developments in the Iranian nuclear program, changes in the Middle East, and political relations between Israel and its neighbors. Prime Minister Stephen Harper’s government has been highly supportive of Israel in the international arena. Peres flies to Canada for a five-day visit with the pro-Israel government and Jewish leaders. The Iranian nuclear threat tops the agenda. President Shimon Peres is flying to Canada Sunday for a five-day visit with the pro-Israel government and Jewish leaders, with the Iranian nuclear threat tops the agenda. Canada is considered one of Israel’s best friends, and Ottawa has been solidly behind the Netanyahu government even when the Obama administration has been at odds with Israel. He will “express gratitude to the Canadian leadership for its stance alongside Israel,” a spokesperson added. Peres is expected to promote economic and scientific cooperation between Israel and Canada and attend the signing of a memorandum of understanding between the Royal Society of Canada and the Israeli Academy of Sciences and Humanities in the field of science and technology. Jewish communities in Ottawa, Toronto and Montreal will host the President, highlighted by an Independence Day reception. President Peres will deliver a speech to the Jewish community in Toronto Wednesday evening, after meeting with Ontario Premier Dalton James Patrick McGuinty during the day. The Montreal Jewish community will host him at a synagogue Thursday morning before he concludes his trip with a meeting with Quebec Premier Jean Charest. Israel has been the victim of frequent anti-Israel protests in Quebec, a predominantly French-speaking province. Most of the province’s Jews live in Montreal, and the Jewish population in Quebec has fallen from a peak of approximately 120,000 in 1971 to less than 93,000 today, according to the Canadian Jewish Federation. “I would like to send my best wishes to those in Canada and around the world who will be celebrating Passover tomorrow. This holiday – which commemorates the liberation of the Israelites from slavery in ancient Egypt – reminds us of the value of freedom and perseverance, and the importance of family, tradition and faith. “Tomorrow evening, as families and friends gather for the traditional Seder meal to recognize this important holiday, it is also an opportunity to think of those who are still struggling and fighting for their freedom around the world. Lawyer and rights activist Alan Dershowitz said last week at Westmount’s Shaar Hashomayim Synagogue that he has been a lifelong Democrat and would never vote Republican. And Mount Royal MP Irwin Cotler is well-known as a member of the Liberal Party who has resisted urgings from members of the community to join the Conservatives. Yet, both men cheered Prime Minister Stephen Harper for his support of Israel, the topic of the event that attracted 1,000 people to the synagogue last Thursday. “I publicly commend Prime Minister Harper for his support of Israel,” Cotler said. “And on this issue, there are no differences between us,” Cotler added. Dershowitz was the keynote speaker at the Steinberg lecture series event, in which he spoke about this week’s Palestinian attempt to unilaterally declare independence at the UN and the “irrational hate” of Israel, especially on college campuses. He blasted Bishop Desmond Tutu of South Africa as an “anti-Semite” and heavily criticized former U.S. president Jimmy Carter. Then, in a conversation format, Dershowitz and Cotler exchanged views on several issues, including the crisis now faced by Israel. The MP cited threats emanating from terrorists in Egypt’s Sinai, from which a recent attack took place; Gaza becoming a base for many terrorist groups; Egypt itself, where the 1970s Camp David peace treaty is “hanging by a thread;” increased arms possessed by Hamas in Gaza and Hezbollah in Lebanon; and tensions with Turkey. Dershowitz said many blame Israel for the hostility emanating from Egypt and Turkey. Dershowitz said Israel should prepare its military “for the next decades in which there will be no effective peace treaty with Egypt, and no effective alliance with Turkey. The Centre for Israel and Jewish Affairs was recently made aware of a lecture given by Professor Cameron Johnston yesterday at York University, which reportedly included an anti-Semitic remark. “Upon hearing of this incident, we immediately contacted York University as well as Professor Johnston directly. While York is currently looking into the matter, it appears that a very unfortunate misunderstanding has taken place. We believe Professor Johnston’s use of an abhorrent statement was intended to demonstrate that some opinions are simply not legitimate. This point was, without ill intentions, taken out of context and circulated in the Jewish community. The Centre for Israel and Jewish Affairs is now the spokesperson for all issues concerning the organized Canadian Jewish community, including those formerly handled by the Canadian Jewish Congress, the Canada-Israel Committee, and the Quebec-Israel Committee. In lecture, I discussed that the course focuses on the texts and not “opinions”. In fact, I stated that for this course opinions are not relevant and I questioned the common idea that everyone is entitled to their opinion. I pointed out that everyone is not entitled to their opinion by giving the example of someone having an anti-semitic opinion which is clearly not acceptable. This was an example of the fact that opinions can be dangerous and that none of us really do believe that all opinions are acceptable. For the record, I am also Jewish which undoubtedly influenced my choice of this example of a reprehensible opinion. Canada’s newly restructured Israel and Jewish advocacy agency finally has a name: the Centre for Israel and Jewish Affairs. The name was announced last week by the organization’s branding committee, which reportedly surveyed preferences from among a select group of stakeholders and interested parties. The new agency oversees and coordinates the work of the Canadian Jewish Congress, the Canada-Israel Committee, Quebec-Israel Committee, National Jewish Campus Life and the University Outreach Committee. The restructuring of Canada Jewish and Israel advocacy organizations was an 18-month-long process conducted largely behind closed doors. The restructuring also resulted in the firing of nine employees, six of them formerly with the Canadian Jewish Congress. All along, some community members expressed concerns that the consolidation of agencies would result in the demise of the 92-year-old Canadian Jewish Congress. After the announecment, Frank Bialystok, the CJC’s Ontario region chair, said his organization has not disappeared. On July 10, 2011, the Canadian Council for Israel and Jewish Advocacy (CIJA) hosted a reception at the Israel Museum in Jerusalem, which celebrated the continued relationship between Israel and Canada. The event was also meant to mark Canada Day, although the festivities were a tad belated. CIJA is the new, unified constellation for all of the public affairs agencies of the Canadian Jewish community. These include the Canadian Jewish Congress (CJC), the Canada-Israel Committee (CIC) and the Quebec-Israel Committee (QIC), which all became part of one organization on July 1. At the event, a formal bilateral agreement was signed, renewing the mandate of the Canada-Israel Industrial Research and Development Foundation (CIIRDF) for another five years. CIIRDF was established in 1994 with a goal of promoting collaborative research and development between private sector companies in Canada and Israel. The organization focuses on the commercialization of new technologies, most of which are start-ups. Since its inception, the foundation has supported over 70 projects, which have yielded approximately $1 billion in revenue for the participating companies both in Israel and across Canada. On hand for the high profile event in Jerusalem were over 140 Israeli and Canadian government leaders, academics, businessmen and community leaders. Israeli Foreign Minister, Avigdor Lieberman; Public Diplomacy and Diaspora Affairs Minister, Yuli Edelstein; and Cabinet Secretary, Tzvi Hauser were all in attendance. There were also other Israeli representatives there, such as deputy national security advisor to the Prime Minister, Col. (res.) Dr. Eran Lerman; deputy director general of the foreign ministry, Ambassador Baruch Bina; former Israeli ambassador to Canada, Haim Divon; chairman of the Israel-Canada Parliamentary Friendship Group in Knesset, Yohanan Plesner MK; director of the Begin-Sadat Center for Strategic Studies at Bar-Ilan University, Professor Efraim Inbar; Professor Gil Troy of the Hartman Center and McGill University; Professor Gerald Steinberg of Bar-Ilan University; and NGO Monitor and Col. Yisrael Tal-Saranga, head of Israel Defense Forces public affairs. Five Canadian members of parliament were at the dinner, visiting Israel on their CIJA-sponsored trip. This list included James Bezan of Manitoba, Judy Foote of Newfoundland, Larry Miller from Ontario, Joyce Murray of British Columbia and Bev Shipley of Ontario. Professor Irwin Cotler of Quebec was also present to show his support. Immediate past UIAC president Barbara Farber, outgoing CIC chairman Moshe Ronen, and CIJA CEO Shimon Fogel all represented the Jewish community of Canada at the event. Other Canadians in attendance were embassy deputy chief of mission, Katherine Verrier-Frechette; military attaché, Col. Michael McLean; commercial counselor, Bonnie Berger; Minister-Counselor, Andre Dorion; and the Canadian Representative to the Palestinian Authority, Chris Greenshields. “This event serves as a much sought after platform to give expression to our deep appreciation for the extraordinary support Canada has demonstrated for Israel over the last number of years and to celebrate the warmth and depth of the friendship between our two democracies,” said Ronen, who spoke at the reception on behalf of Canada’s Jewish community. Call it the Canadian Council for Israel and Jewish Advocacy 2.0 (CIJA 2.0) – for now. The much-anticipated reconfiguration of the existing Canadian Jewish community national advocacy structure will officially begin on July 1. Gone are organizations including the Canadian Jewish Congress (CJC), the Canada-Israel Committee (CIC), Quebec Israel Committee (QIC), the University Outreach Committee (UOC) and National Jewish Campus Life (NJCL). All their functions have now been absorbed into a greater Canadian Jewish advocacy apparatus under the auspices of the Canadian Council for Israel and Jewish Advocacy (CIJA), which had previously acted as the umbrella organization for the above-mentioned agencies. … As a national entity, CIJA 2.0 will create policy and messaging for “local partners” throughout the country’s Jewish communities. Each local partner will be “anchored or embedded” in a local federation – in smaller Jewish communities without a federation presence, there will be an alternative. … CIJA 2.0 “will provide resources” for all local partners, and the chairs of the local committees will, together, form a national cabinet.